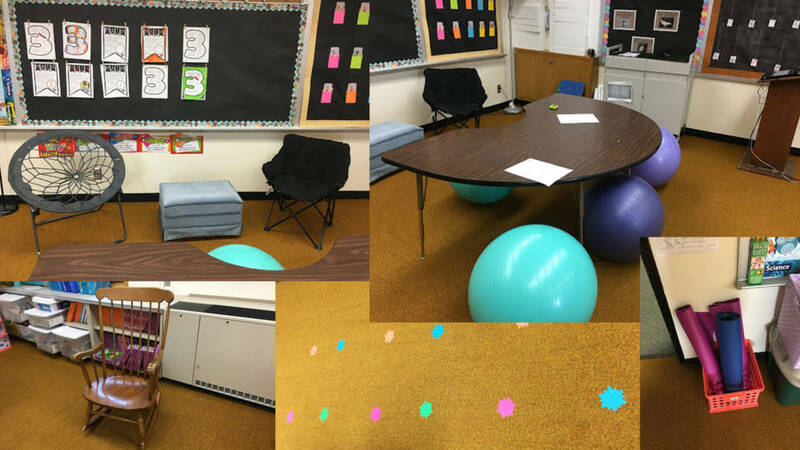 Flexible seating in classrooms has become popular over the past few years as educators try to make school feel like a welcoming place with different kinds of spaces for different types of learning. Frustrated with static rows of clunky desks, some teachers have taken to rearranging their rooms, bringing in furniture from home, and generally trying to shake up the way classrooms feel by paying attention to lighting, color and clutter. Educators who have followed this path insist there are some serious considerations to keep in mind. Fox spent last year transitioning into a flexible seating classroom, but this year she got rid of the desks entirely. She likes the way it opens up the space for students to move and makes them feel like every part of the room is theirs for learning. Fox reinforces this feeling by letting students rearrange the tables and chairs every few weeks. Each student gets a chance to set up the room on a rotating schedule (made easier this year because Fox has only eight students). “For the most part my classroom is a lot more positive,” Fox said. 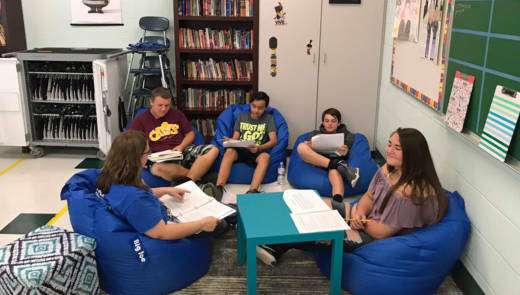 “My students are learning to interact with each other by using the flexible seating.” Sometimes two students want the same chair and Fox said they have learned valuable conflict resolution skills in those moments. Students know if they get into an argument about where to sit Fox will choose for them, and students don’t want to lose the privilege of free choice, so they’ve learned to peacefully resolve their problems. When thinking about moving to a flexible classroom design, the most important person to consult with may be the custodian. Getting buy-in from administrators is important, but the janitorial staff will be directly impacted by these physical changes, so making sure they are on board is both respectful and crucial to the project’s success. They also might know about unused furniture in storage that could be repurposed inexpensively. Students are also great consultants. “No matter if you have money or you don’t have money, I learned this the hard way, you have to get the kids involved,” said Brian Seymour, the director of instructional technology for Pickerington Local Schools in Ohio. He works in a district lucky enough to have some resources, so they put the question to students in a Shark Tank-like competition on classroom redesign. It all started when the district went one-to-one with devices and no longer needed a computer lab. Administrators wanted to turn that room into a “learning lab,” collaborative space teachers could use when they needed a more flexible space for a project or activity. The experiment was such a success that teachers wanted to implement aspects of the learning lab design in their own classrooms. Seymour and his team turned the momentum into a project-based learning activity for students. They researched the active learning movement, priced out different furniture options, crafted budgets and put together plans that they presented to school officials. “Almost every group got rid of the teacher desk,” Seymour said. Students even used 3-D modeling software to make sure their choices would fit in the rooms. The team that won is now helping the district rethink classrooms in several other buildings. Fox also asked her students to give input on her space, but she didn’t have a budget for fancy furniture. Instead, she brings in items from home, looks for cheap furniture in thrift stores, and buys exercise balls and yoga mats at the Five Below. Her advice for teachers on a budget is to start with what they’ve got and ask for donations from friends and local businesses. She has velcro “sit spots” on the floor where her kids sit when she needs to do some direct instruction. Otherwise they work wherever is most comfortable for them around the room. Some districts have policies that require desks in the classroom. April DeGennaro teaches advanced kids in a Georgia district with that policy. Her students are all different ages who get pulled out of their general education class for more advanced work, but aren’t all working on the same thing at the same time. The traditional classroom with desks in rows facing forward makes very little sense for DeGennaro’s teaching environment. She has pushed the desks to the perimeter of the room so they form a border facing the wall. Some students sit there when they want to work quietly on something alone. Storage is another consideration. In a traditional classroom with desks, especially in elementary school, students store many of their supplies in their desks. When teachers remove the desks they come up with creative ways to deal with storage. Fox uses bookshelves for students’ notebooks and has each student store their markers, scissors and other supplies in bath totes that she repurposed. Storage and organization systems could be another fun challenge to put in the hands of students. Fox also spends time laying out the expectations for how students should behave with the new class setup. Exercise balls may be a great way for fidgety kids to stay focused, but they’re also fun to bounce and throw at one another. Fox finds she has to continually remind her students about appropriate behavior and remain flexible herself. “It doesn’t work if you go in and change your learning space, but you’re super rigid about it,” Fox said. When thinking about different spaces in the classroom, it may be helpful to think about David Thornberg’s framework for the learning spaces humans have always used: the campfire, the watering hole and the cave. The campfire is a place for storytelling, the direct flow of information from one person to another. The watering hole is a social place where peers can learn from one another. And the cave is solitary, a space for personal reflection and individual work. Teachers who have successfully moved to flexible learning spaces don’t just ditch desks. They provide all three of these learning spaces to kids.